Debut reading of “Closing Credits: An Evening with Frank Capra”, a new play by award-winning writers George Morgan and Loren Marsters. The Ventura Improv Company is proud to present the world premiere reading of a new play about legendary film director Frank Capra. 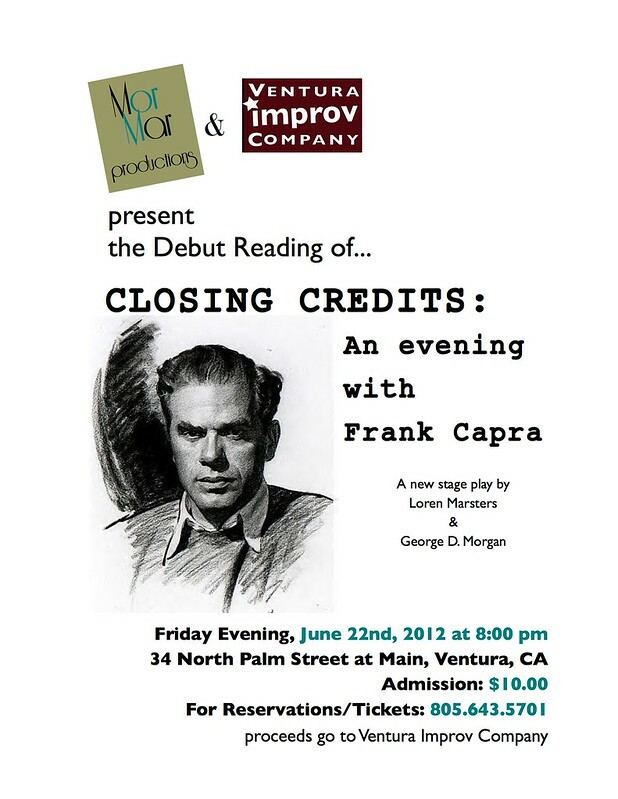 The play, entitled CLOSING CREDITS: AN EVENING WITH FRANK CAPRA, is the collaborative work of long time VIC performer George Morgan, and former Ventura County resident and playwright Loren Marsters. From his early days as a peasant Italian immigrant to his graduation from Caltech – from his homeless wanderings during the Great Depression to his unlikely ascendance as America’s premiere film director – from his enlistment and service in the U.S. Army to his eventual fall from Hollywood grace, the life of Frank Capra is a story that is often inspiring, sometimes tragic, but always engaging. CLOSING CREDITS: AN EVENING WITH FRANK CAPRA will be one night only: Friday, June 22, at 8:00 pm. Tickets are $10, and proceeds go to the Ventura Improv Company.